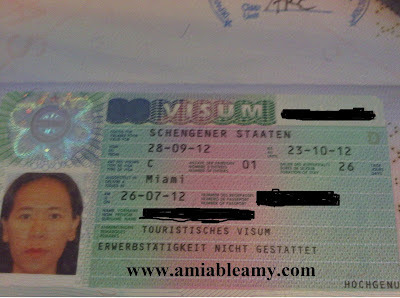 Hubby and I went to Miami last July for me to apply a Schengen Visa for our Europe Travels. 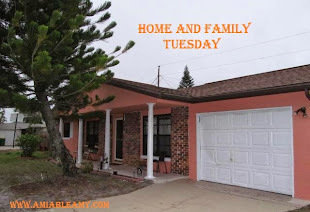 We planned to visit a family in Spain, a friend in Germany and a classmate in France. Since we will be touring Germany most of the days, we decided to get a German Visa so; I made an appointment at German Consulate in Miami. I did it all online and followed the requirements given in their website. Here's the link of the Cover Letter of Tourist German Visa that I made. I was already having doubts about the passport picture that I got from WalMart. It was an old lady who took my passport photo and was using an ordinary digital camera. The result was blurry and not according to the standard for German Visa. We arrived 30 minutes before my schedule so; when the man in-charge checked my photos he told me that I should get another passport photo at CVS a block away. I gladly complied and was back in 10 minutes. Take note: No earrings, no smile and photo must be formal and serious. When my name was called at 11 AM, the lady was very nice, courteous and friendly. She asked all the original documents with corresponding photo copies. I got all that except the 3 most important docs (LOL) travel itinerary, travel insurance and airline ticket reservation. She was kind enough to have me come back at 1:30 that afternoon and gave me time to gather those three important documents. We went back in Intercontinental Hotel in Miami (stayed a night) and booked our plane ticket, reserved a hotel accommodation in Germany and call my insurance company to fax the required documents that I needed. The Concierge was very helpful and gather all the fax documents sent to me at the hotel. I went back at exactly 1:26 PM and was relieved that the lady called me right away. I gave her all the documents she needed and asked few questions about the travel. She then told me that I was so organized and all documents presented were neat. We both laugh when she reminded me that 3 important documents were missing but, other than that, she was impressed. Then, I was asked if I wanted my passport delivered by mail or pick-up and I chose the latter. The interview went well and when we went back yesterday to get this Visa, the guard already knew me by face. Everyone at German Consulate in Miami are very nice and I was treated excellent. God bless them. same requirements ra pod diay diri Amz... when I applied for my Schengen Visa, mao pod na requirements...pero gipa deliver lang nako ako visa sa house kay 1 week pa man makuha ug dili man ko mo stay ug 1 week sa Manila, so gi deliver nila pero ako nagbayad sa delivery...before ko miadto sa Swiss Embassy, gi-check sa nako tanan ang requirements kay appointment, call ra man sa office... then ingnon ra man ka nga bring all the necessary papers and check these papers sa website nila... so pati itinarary, insurance or return ticket..naa jud ko...so pagtawag sa akoa, wala jud koy kulang, dili pareho sa kasabay nako nga migawas na pod kay nag pa photocopy, mali ang picture etc etc.. haha.